Local anticuts campaign groups Unite Community, Stroud Against the Cuts, Cheltenham & Gloucester Against cuts are working together to mobilise for the Tories Out! 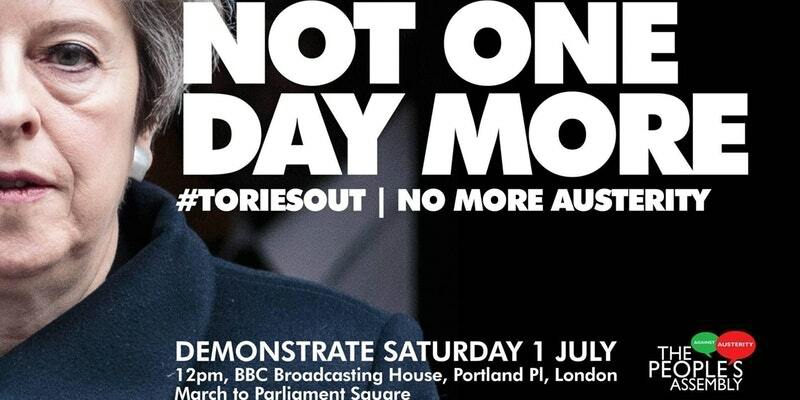 Not One Day More demonstration in London on Saturday, July 1st. There are enough reasons to fight this government and the system it represents – that was before Grenfell Tower which, in the most awful way. represents everything wrong in society. At the moment we have transport organised from Gloucester, Stroud, the Forest of Dean – with more bookings we can include Cheltenham as a pick up point. Leaving Stroud 8am/Gloucester 8.30 am – return by approx 8 pm — free for Unite members, £12 waged/£6 unwaged.